Christmas is often a time of overindulgence so, come January, it may be time to give your body a rest and think about doing a detox! This doesn’t necessarily need to be an extreme regime but just taking some sensible and practical steps to help reduce the toxin overload on your liver. Your liver naturally detoxes your body constantly anyway, but it may just need a little helping hand. Here, Emma Thornton, nutritionist and women’s health advisor with A.Vogel (www.avogel.co.uk) offers some simple tips to give your body a post-Christmas cleanse. Food – Packaged and processed foods are readily packed with preservatives, artificial colours and sweeteners, not to mention added sugar and salt. Eat fresh foods and cut your intake of refined sugar, processed foods, alcohol and meat. Then opt for organic fruit and vegetables which will ensure they haven’t been treated with pesticides. In particular, watch out for the ‘dirty dozen’ which includes: apples, strawberries, spinach, tomatoes and potatoes. Water – Drink plenty of water but perhaps consider using a water filter to help purify tap water. Air – Although polluted air is hard to avoid, simple steps can help: go for a jog in your local park rather than alongside a busy road! Chemical-laden products – Beauty, cleaning and gardening products are often chock-full of chemicals which you end up absorbing or breathing in. Try using natural alternatives instead. Fresh fruit and vegetables – Fruit and vegetables are nutrient-packed and full of vitamins, minerals and antioxidants. Antioxidants such as vitamins C and E, and beta-carotene help protect the cells around our body from damage by free radicals. Omega-3 rich foods – Omega 3 is naturally anti-inflammatory so up your intake with oily fish, nuts and seeds. Bitter herbs are extremely beneficial. Try having a small bitter salad with some chicory, endive or rocket before your meals to help give your digestion a kick-start. Dandelion leaves act as a gentle diuretic which helps encourage the excretion of toxins from the body and research has shown that globe artichoke helps support the functions of the liver. Finally, milk thistle is rich in antioxidants which help scavenge free radicals which can damage your body cells. Try these simple tips to help along the detox process, from Claudia Norris, creator of the Happy In Body weight loss programme (happyinbody.com). 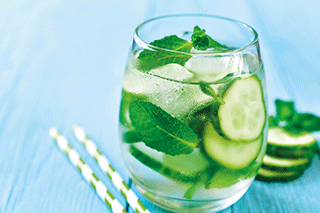 Add cucumber slices to your water. Not only will your water taste more refreshing but the cucumber acts a natural diuretic helping to flush excess fluid and toxins from the body. This can help you look and feel less bloated and reduce puffiness. Introduce two pieces of fruit with your breakfast, three pieces of veg with your lunch and three pieces of veg with your dinner. Fill up your plates with a variety of colours to ensure maximum nutrient intake! The different colours of fruit and veg contain various phytonutrients which can boost your immune system, help cleanse your body, and ensure you don’t go hungry while losing weight. Avoid wheat for 10 days. Notice what happens to your body when you avoid wheat. Many people feel less bloated. Cut down on sugar. Excess sugar is converted into fat in the body. It also destabilises your blood sugar levels, leaving you craving the next sugar fix. Cut down on refined sugars and reset your taste buds by limiting fruit as your main source of sugar. Need to shift a few excess pounds after Christmas? London Nutritionist Lily Soutter (www.lilysoutternutrition.com) suggests some tips for maximising your weight loss. Set yourself up for success by having a healthy but hearty breakfast – and don’t forget to include protein! Research has shown that those who eat breakfast tend to have a more of a balanced diet, are less likely to be overweight, lose weight more successfully and are less likely to snack unnecessarily. One study, published in Nutrition Journal in 2015, showed that participants who consumed good quality protein at breakfast stayed ‘fuller for longer’, which in turn prevented overeating later on in the day. A study of 1,700 people showed that food diaries may actually double weight loss! The simple act of writing down what you eat can encourage you to be more mindful with your food choices. Try recording your food intake on a Post-It note, take pictures on your phone, record on the notes section on your phone, send yourself text messages or keep a record on an app. Meal times shouldn’t be a race to the finish line. Take your time to chew and put your fork down between each bite. Savour the flavours to give your brain time to register your hunger and fullness cue. Mindful eating may increase pleasure and satisfaction from the food we eat, which may lead to eating fewer calories throughout the day.